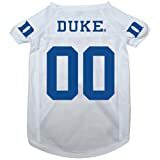 Trying to represent your favorite sports team and find an awesome accessory for man's best friend? Well, if you're a sports fan and dog lover you are in the right place! 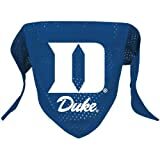 Find a great deal on your Duke Dog Collars from the available items below. 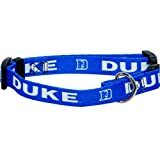 We've got all of the available sports fan dog collars for College, MLB, NBA, NFL, and NHL right here at SportsFanDogCollars.com. 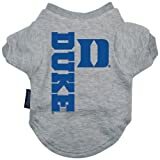 Pet jerseys are constructed of a polyester material, offering a V-neck cut and sizing to allow for a comfort fit (high cut on stomach area for the male dog). Jerseys are decorated in full team colors with official team logos. Machine Washable. Jersey sizing available are small - Length 12- 13" Girth 14-18" and Neck 10-13"; Medium Length 14-15" Girth 16-20" and Neck 11-14"; Large Length 16 - 17" Girth 20-24" and Neck 13-16"; Extra Large Length 18-20" Girth 27-30" and Neck 16-21". Breed size Standards - based on length Small - Brussels Griffon, Dachshund-miniature, Norfolk Terrier, Toy Poodle, Yorkshire Terrier. Medium - Basenji, Bichon Frise, King Charles Spaniel, Miniature Poodle, Pekingese, Pomeranian, Silky Terrier. Large - Beagle, Dachshund, Jack Russell Terrier, Lhasa-Apso, Pug, Schnauzer-miniature, Scottie. Extra Large - Australian Terrier, Border Collie, Cocker Spaniel, Corgi, Schnauzer, Standard Poodle, West Highland Terrier. 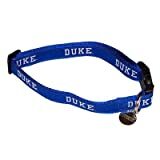 Duke University Blue Devils Collar Charm. Exclusively from Diva-Dog. Made with high tensile nylon webbing. Decorated in full color with your favorite sports team. Collars are adjustable and feature a quick release buckle. Leads are compromised with a sturdy nickel-plated snap hook for ease of attachment to collar. Collars and leads come in three widths; Extra Small to Small (5/8"), Medium (3/4"), Large to Extra Large (1"). We are the industry leader in high-quality, innovative licensed sports products for MLB, NASCAR, NBA, NFL, NHL and over 80 colleges and universities. After 25 years in business, Hunter Manufacturing -- based in Lexington, KY -- has become an industry leader serving thousands of customers with hundreds of products across several categories, including plastic & high performance drinkware, pet products and game day essentials. These officially licensed products are available for NFL, MLB, NHL, NBA, NASCAR, Kentucky Derby and over 80 NCAA colleges & universities. Hunter Mfg. is a trusted name in high-quality, innovative licensed sports consumer products. Max is a Terrier mix who lives in New York with his owner Katie. His life gets turned upside down when Katie brings home a sloppy new pet named Duke. If you're a fan of the 2016 animated feature film The Secret Life of Pets then have we got the perfect item for you! Take a look at our Adult Secret Life of Pets Max Halloween Headpiece and get into the style of everyone's favorite movie pup this season! This item includes a full headpiece with character face and attached dog collar. Join forces with Duke and prevent Snowball from building his army of abandoned pets this season. Pick up our Adult Secret Life of Pets Max Halloween Headpiece today! Available at CostumeKingdom.com! Officially Licensed Dog Collar. Adjustable nylon dog collar. Hard plastic clasp for easy access to open and close. Fits small dogs. 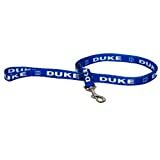 Officially Licensed NCAA College Team Charms Perfect gift for four-legged fans of the Duke University Blue Devils! These jewelry-quality charms are crafted from antiqued lead-safe pewter and are hand-enameled. FeaturesMade in the USA Warranty:If you are not completely satisfied with any item we will be happy to exchange substitute or issue a refund. As a general rule we cannot accept returns on such products as products marked as Clearance or special orders. SpecificationsColor: Blue Size: 1 x 2 in. 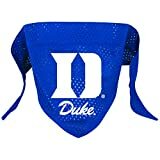 Dog bandana decorated with official team primary logo, features a sewn in loop to slide over dog collar and is constructed in micro mesh polyester. Show support of your favorite team with this officially NCAA licensed collar made with woven ribbon sewn on high-tensile webbing featuring an embroidery of your team's name & logo in vibrant team color! - Quick-release buckle. - ID tag made with engraved team logo with silver-tone finish. Your dog's name can be engraved on back of tag. - Size Large measures: 1" Width. - Fits: 16" - 26". - Size Medium measures: 5/8" Width. - Fits: 10" - 14". Decorated in full team colors with official team logos. Constructed of Polyester mesh. Features a sewn in loop to slide over dog collar. We are the industry leader in high-quality, innovative licensed sports products for MLB, NASCAR, NBA, NFL, NHL and over 80 colleges and universities. After 25 years in business, Hunter Manufacturing -- based in Lexington, KY -- has become an industry leader serving thousands of customers with hundreds of products across several categories, including plastic & high performance drinkware, pet products and game day essentials. These officially licensed products are available for NFL, MLB, NHL, NBA, NASCAR, Kentucky Derby and over 80 NCAA colleges & universities. Hunter Mfg. is a trusted name in high-quality, innovative licensed sports consumer products. Dog Seat Belt Pet Dog Cat Car Seat Belt Safety - 2 Pack - Adjustable Safety B. Meet Duke. Duke is an enormous overbearing brown mutt who is rescued by Katie. When Katie introduces Duke to his new brother Max, they are forced to get along despite Duke's behavior. If you have ever wondered what your pets do while you're away our Adult Secret Life of Pets Duke Halloween Headpiece is just the item for you! This item features a full headpiece with character face and attached dog collar. Join forces with Max and prevent Snowball from building his army of abandoned pets this season. Pick up our Adult Secret Life of Pets Duke Halloween Headpiece today! Available at CostumeKingdom.com!